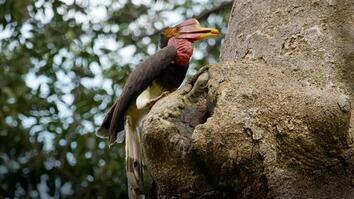 What does it take to photograph the helmeted hornbill? Patience. National Geographic photographer Tim Laman teamed up with Rangkong Indonesia and the Thailand Hornbill Project and spent months in the field just to get a glimpse of the extremely rare bird. 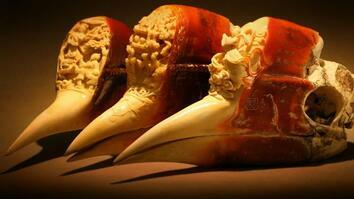 The helmeted hornbill is one of 57 hornbill species in Africa and Asia. 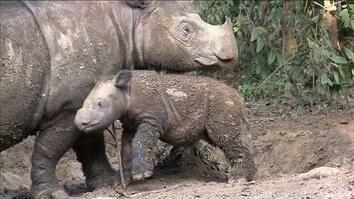 It’s found only in the lowland forests of Brunei, Indonesia, Malaysia, Myanmar, and southern Thailand. The helmeted hornbill stands apart from the other hornbills because its casque—the horny helmet above its beak—is mostly solid with a thick layer of keratin. But that unique trait might also be the birds' undoing. Softer than ivory and easily carved, hornbill casques are in high demand in Asia, to be fashioned into beads, pendants, and intricate works of art. Illegal poaching has caused this bird to be on the critically endangered list. Read the full story: “Poached for Its Horn, This Rare Bird Struggles to Survive,” featured in the September 2018 issue of National Geographic. This video was produced in collaboration with the Cornell Lab of Ornithology. National Geographic is partnering with the National Audubon Society, BirdLife International, and the Cornell Lab of Ornithology to celebrate the centennial of the Migratory Bird Treaty Act. Watch for more stories, books, and events throughout 2018, the Year of the Bird.